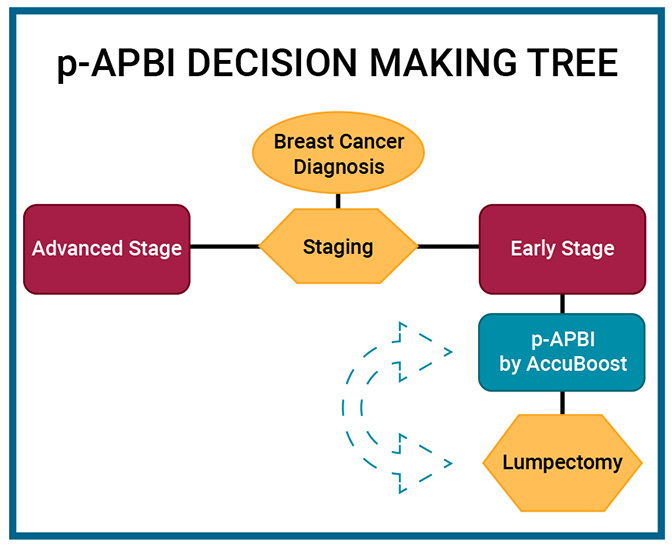 Purpose – The purpose of the study is to evaluate the feasibility of APBI by the AccuBoost design, delivered pre-operatively for women with resectable, early-stage breast cancer. Evaluate feasibility and toxicity of pre-op APBI including the rate of surgical complications. Assess and report the cosmetic outcome, tumor recurrence, comparative dosimetry of pre-op and post-op APBI, and provide preliminary data for follow-up trials. the pre-operative approach is widely utilized in other tumor sites and can provide a novel opportunity to study radiation response in breast cancer. Study population – Eligibility for participants in the study is limited to patients with a confirmed histological diagnosis of invasive breast carcinoma or DCIS who are candidates for breast conserving surgery with age greater or equal to 60 years and life expectancy of more than 6 months. Tumor size by imaging must be less than 2cm, and patients must be lymph node negative. Target definition – The study relies on the presence of a radio-opaque clip placed at the time of biopsy for target localization. The gross tumor volume (GTV) will consist of the tumor as defined by AccuBoost images. The clinical tumor volume (CTV) to account for a subclinical disease will include GTV with at 1.5 cm radial margin limited by the chest wall and 0.5cm from the skin. The planning tumor volume (PTV) will consist of the CTV with a 0.2cm – 0.5cm margin. To minimize skin dose, only Skin Dose Optimized (SDO) applicators are allowed in this study. Dose fractionation – Patients are to receive a total dose of 28.5 Gy delivered in 5 daily fractions. Both axes are to be treated in each fraction. Treatment is typically delivered over 5 to 10 days. Surgery – A partial mastectomy (with or without a sentinel node biopsy) is to be performed between 4 and 12 weeks of completion of APBI. Toxicity assessment and endpoints – The primary goal of the study is to evaluate the feasibility of p-APBI and report on post-operative complications. Other endpoints are assessment of late toxicity, cosmetic outcome as well as local and distant disease control. The study is open to all AccuBoost users with interest in clinical research.